"These spiced pumpkin cookies are tasty little bites that scream fall. A great way to make use of a cookie press outside of the holiday season!" Beat brown sugar and butter together in a large bowl with an electric mixer until creamy, 1 to 2 minutes. Beat pumpkin, egg, and 2 teaspoons vanilla extract into butter mixture. Whisk flour, 2 tablespoons cinnamon, ginger, nutmeg, baking powder, cloves, allspice, and salt together in a bowl. Add flour mixture to pumpkin mixture and stir until dough is completely combined. 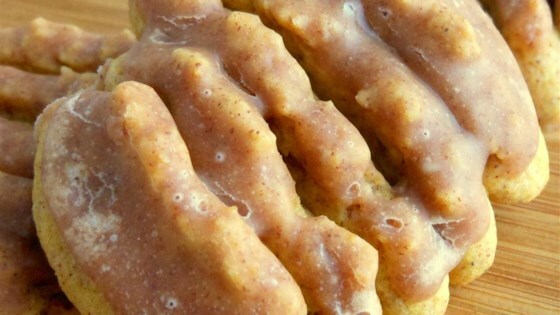 Fill a cookie press with pumpkin cookie dough. Press cookies 2-inches apart on baking sheets. Bake cookies in batches in the preheated oven until edges begin to brown, 5 to 8 minutes. Transfer cookies to wire racks to cool completely. Whisk confectioners' sugar, milk, corn syrup, 4 teaspoons cinnamon, and 2 teaspoons vanilla extract together in a bowl to an icing consistency. Dip cooled cookies in icing and shake gently to remove excess. Place iced cookies on a sheet of waxed paper while icing dries. See how to make spicy, frosted pumpkin cookies. The dough would not come out of the cookie press no matter what I tried. I rolled them into balls and flattened them with a fork, worked out well.